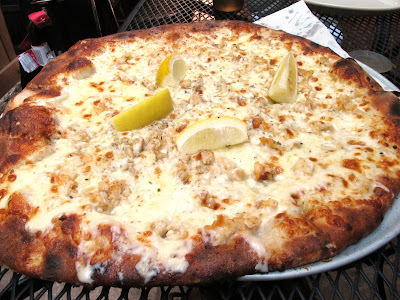 I grew up in New Haven, and thought that the whole world hade pizza like we did. When I moved away, I was shocked that no one could come close! I went home to New Haven for this Thanksgiving. My husband and I decided that in order to finally figure out who had the best pizza, Sally's, Pepe's or Modern, we just needed to have them all side by side. Well, the stars aligned and we were able to get 2 mozzarella pizzas from all three restaurants. We had a blind taste test with 8 participants, and in a unanimous decision, Sally's won! I was shocked because I have always been a Pepe's lover. Modern came in second, with Pepe's a close third. It is good to know that there are other pizza obsessed people on the planet...I am not alone!